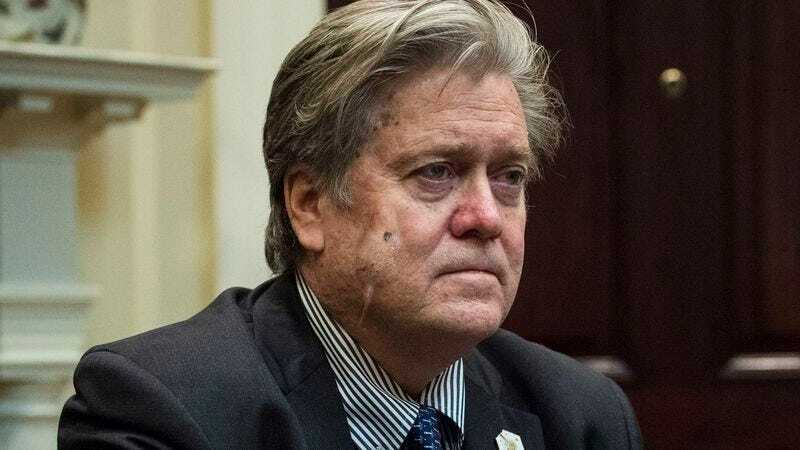 WASHINGTON—Noting that the White House chief strategist’s skin stretched and bulged as the animal scurried about, sources confirmed Tuesday that a rodent was clearly making its way through Steve Bannon’s body during a national security meeting. “You could see the outline of a rat or maybe a very large mouse scampering inside Mr. Bannon for the entire 90-minute strategy session,” said Deputy National Security Advisor K.T. McFarland, adding that at one point the rodent-shaped lump paused and turned in circles several times before darting down the former Breitbart editor’s neck. “I tried not to stare, but the thing kept peeking its head out of Steve’s nostrils. I just had to look away when its tail popped out of his left tear duct.” At press time, White House sources confirmed that a faint squeaking noise could be heard every time Bannon opened his mouth to speak.